First, we leaned in. Now we stand up. In this “much-needed combo of real talk, confessions, and lessons learned along the way” (Chelsea Handler), Jaclyn Johnson—the founder and CEO behind Create & Cultivate, the fastest growing online platform for millennial businesswomen—offers a rallying cry for a new generation of women who are redefining the meaning of work on their own terms. With stories from leading female entrepreneurs including Christene Barberich (co-founder of Refinery29), Alli Webb, (creator of Drybar), Morgan Debaun (founder of Blavity), Jen Gotch of Ban.do, Rebecca Minkoff, and Kendra Scott, you will learn the tips and tricks from the best in the business while cultivating the passion and happiness you need to succeed. 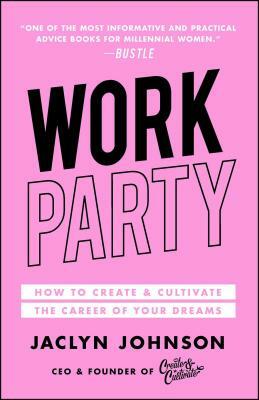 “This is the book you need to take your career to the next level—on your own terms” (Refinery29). Jaclyn Johnson is the CEO of Create & Cultivate, the fastest growing online platform and offline conference for millennial women seeking to build the career of their dreams. Jaclyn has been named to Forbes' 30 Under 30 for Marketing and Advertising, a “Self-Made Woman” by the Los Angeles Times and “A Woman of Note” by The Wall Street Journal, among other accolades.